Faculty in Washburn University’s School of Nursing have been focused on teaching students not only how to exceptionally care for patients, but also the economics of health care and the importance of interprofessional practice. “Health care is expensive, and as a country, we struggle to pay for it,” said Monica Scheibmeir, dean, School of Nursing. To help address these financial and health care concerns, many faculty members and community organizations have been working to develop a new clinic in the last year that serves the community and provides a place for students to practice what they are learning in the classroom. The Pine Ridge Family Health Center, a collaboration of the Pine Ridge community, the Topeka Housing Authority and Washburn University, brings culturally relevant interdisciplinary services – affordable and accessible primary and urgent care, financial literacy programs, and health literacy programs to a community in need. Pine Ridge is Topeka’s oldest and largest public housing development, and it has a high percentage of individuals living in poverty. The average income in the neighborhood is about $9,000 per year, and 51 percent of the Pine Ridge population are children under the age of 17. As part of a Curriculum To Community grant led by Shirley Dinkel, professor, and faculty and staff from the School of Nursing, School of Business, communication studies department and Office of Sponsored Projects have led students in this common initiative. The collaboration with THA started a few years ago when Ure, who focuses on interprofessional education for the School of Nursing, started taking undergraduate nursing students to perform physicals on preschoolers in the neighborhood. After getting other faculty involved in the Pine Ridge community, ideas for a new clinic started to emerge. Through a competitive grant process from the National Center for Interprofessional Practice and Education, Washburn was awarded the seed money to develop the curriculum to teach students how to create sustainable innovation in their own communities. Of the 16 nursing schools who received this initial funding, Washburn was the only Division II nursing program among the chosen 16. 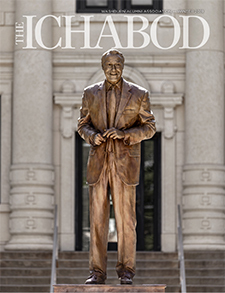 Scheibmeir said Washburn received the grant money because it already focused on interprofessional education with its unique doctor of nursing practice program led by Dinkel. Students are required to take courses from the School of Business so they understand the business of health care. Combined with the School of Nursing and communication studies department working together on health literacy, they knew they had the right people in place to receive the money. After the funding was received, three teams were created to move forward on how to build the curriculum and clinic, and a community assessment was completed. The vision and mission of the clinic were created by doctor of nursing practice students, and they worked closely with the Topeka Housing Authority to make sure needs were being met. “We didn’t want to move forward without knowing what was important to the residents, and they very clearly identified their strengths, weaknesses, and challenges, and were specific about what they needed to live a better life,” said Dinkel. 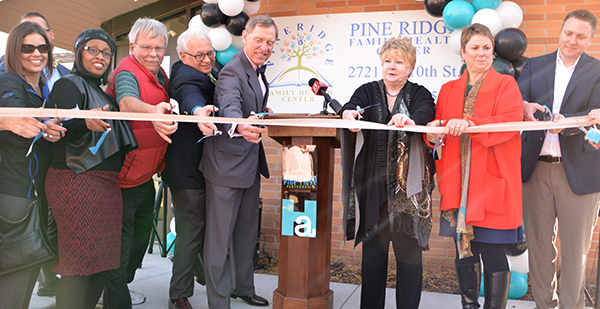 Within a year, teams came together to create the Pine Ridge Family Health Center, a renovated four-bedroom home in the neighborhood. It will be staffed by students under the direction of Jane Brown, a certified family nurse practitioner, who has previously run the School of Nursing’s Mobile Health Clinic and has served other low-income communities. The School of Nursing knows of no other clinic like it in the nation that is owned and operated by a housing authority and serves as a dedicated training site for nurse practitioner students.